In the 19th century, flying with passengers was entirely with balloons. In 1825 Charles Green was making successful balloon ascents and taking up a brave paying public. The sites for such flights were confined to towns such as Kendal, Carlisle and anywhere where there was a co-operative gas works. At Kendal, Charles Green would climb to about 1,500 feet then, drifting in the wind, land two or three miles away. He would return to the field to rapturous applause. A later flight, with a young lady, climbed above the clouds to 5,300 feet and landed near Appleby. He made over 500 ascents and, when he was 70, climbed to 22,000 feet. In the records no mention of how he survived without an oxygen supply! In 1889, a ’Professor’ Higgins and a Miss Le Voy were making balloon ascents, often to 4000ft, when Miss Le Voy would descend by parachute. Hysterical crowds of 2 to 3000 people watched. No organised air transport was possible. Both before and after WWI the main centre for flying in Cumbria was on Windermere. Here the Northern Aircraft Company was established with a club, hangars and workshops. This was at Hill of Oaks on the eastern shore of Windermere, south of Bowness. In 1918, after WWI, there was a surge of ex-RAFC pilots buying surplus aircraft to give passenger flights. They moved from place to place hoping to gain trade. Prior to World War II there were no organised air transport services in Cumbria. During WWII, eight new RAF airfields with paved runways were built in Cumbria, plus three grass airfields. 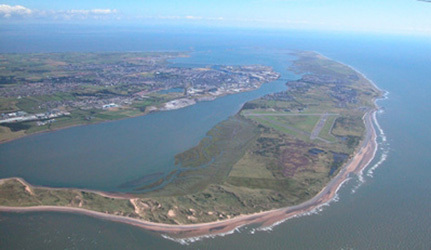 Of these, only Carlisle and Walney Island (photo above) are in commercial use. Post WWII, at both Carlisle and Walney, attempts to run small feeder airlines were started and failed. In 2008 only Carlisle at Crosby in Eden may have a commercial future, having been bought and upgraded by Air Stobart, an off-shoot of the Eddie Stobart transport company. Two well-established pilot training organisations are based at Carlisle. At the disused RAF airfield at Kirkbride, some training is carried out on gyro-copters plus a thriving flying club. A potted history of this airfield near Barrow-in-Furness. A website charting the history of the Sunderland Flying Boat factory that once stood on the shores of Windermere, and the nearby settlement specially constructed to house the factory workers and their families.